crapabear wrote: what kind of experiments are you doing with your test myth generator? [...] What kinds of myths are we talking about, and how crazy can the results get? Toady One - (some emphasis added) wrote: These myths are meant to take the world from its starting point (whether that's primordial chaos, or an endless mud flat, or a cosmic egg, or coupled divine beings, or nothingness, or an endless cycle, or whatever), and then bring the story up to the point where the year 1 situation of world generation has solid backing, in terms of the existence of the proto-civs, the land, the megabeasts, the underground, all of it. Yeah, we started playing with it more seriously because of the upcoming w.g. artifacts and the religious stuff coming for start scenarios, and now we're pretty sure the myth generator will be put in the game either before or during the first w.g. artifact release, since they'll be tied together. And who knows what else will happen. I'm not sure how to evaluate the quality of the results -- say, after some stuff happens and we have some freshly created dwarves, the celestial ibis mates with the sun and lays an egg which contains the progenitors of a giant-sized race who all come to reside in their lost city and forge the device which weaves the destiny of the dwarves and the dwarves rebel and break the device and that's why dwarves grow old and die now, or whatever. It just grinds away and things happen, tossing in different worlds and nature spirits and forces and races and artifacts and second-generation gods and whatever. At the end there's a kind of overlap where everything is explained (why dwarves die, etc.) but you've also sort of started history -- this leads to questions about whether you'd be able to play in an actual Age of Myth where dwarves don't yet age and the sun doesn't exist, or something. As usual, the number of options will simply expand over time, and the myths will only be partially used at first. It leads to lots of interesting relationships that differ from world to world, and we'll try to use those in the ways people talk and what they can do, but it's a large project. I also tried to experiment a bit with building origin stories from the facts at hand, so it can trace back and find the relevant events and make a paragraph containing only the pertinent bits, so different races might see things differently, but that's all very rough. There's also the matter of the current "localized" pantheons, and how that will play out when there's actually a unifying correct story is unfortunate, in terms of cultural differences. We might play around with distortions of the true data, and just having everybody be partially wrong (or everybody is right, in their way), but that's always hard, especially early on when we don't have a good handle on the data structures for correct data. Lots of options, lots of ways to handle it, and we'll only get to some of them. We might be approaching the point where we can actually have a nice slider for the simple world gen parameters, in terms of supernaturalness (although dwarves would stay at the lowest setting for a long while yet). Dwarf Fortress knows me well. Silverware approves of the Fifty Inch Dwarves! Last edited by Talvieno on Fri Sep 04, 2015 9:57 am, edited 1 time in total. Love that expression. Kudos for Giant Dwarves! Dino has inspired me to fire DF back up! I'm also quite curious to hear your summary of how your fort went, Dino. That image doesn't work for me, Silver. Well, Tal, I should have taken some screenshots in retrospect, but well. 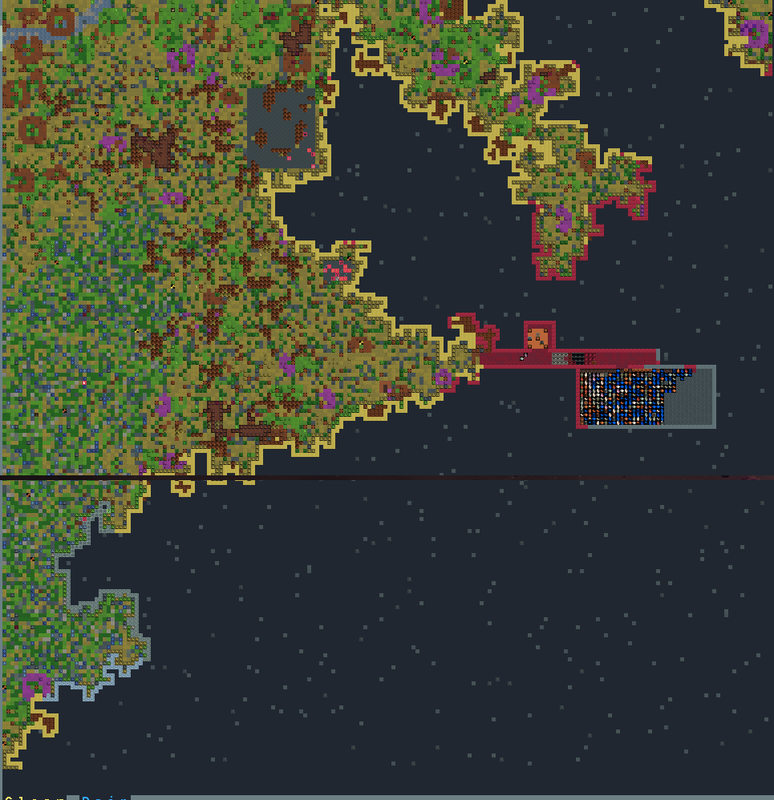 I mostly followed the quickstart guide on the wiki, so I had a pretty easy embark - low evil and savagery, a river in the corner of the map, lots of metal and layers of soil. The only downside was that it was in some sort of savannah biome, so there wasn't too much rain, which made the grass dry pretty easily. The start went pretty good - because of the soil layers it was easy to set up an underground plump helmet farm and still like the wiki described, so we had drink! We didn't have any extra food production for a while except picking plants and berries, but they didn't seem to mind. The animal farm did a bit less well - I made a pasture but didn't figure out that you had to assign animals manually so our yaks and cows kept starving to death. After I got the basic workshops done I figured out that my hunters could go hunting if they had a crossbow and bolts, so I made them those - they used a ton of bolts (I had to make a workshop to keep making them all the time) but at least brought back some meat. I think. In retrospect I'm not sure I have the butcher thing figured out, (how do you make the correct stockpile near the butcher? ), but our meat numbers seemed to go up, so I was fine with it. I discovered the rest of basic crafting on the way - rock crafting to make stuff to trade, smelter and furnace when a dwarf with a strange mood suddenly demanded metal bars. We found platinum and gold long before any useful metal like iron, so he made a shiny cage out of platinum. So everything was going nice and dandy, there was food, people had separate bedrooms, all that stuff. The only thing that went wrong was one dwarf getting in a strange mood and I couldn't give him what he needed, so he went melancholic and starved himself - I only noticed he did this inside when clouds of miasma started to arise. No problem, I made a corpse stockpile outside, they carried him there and that was that. The only thing I hadn't really figured out was the militia - I made some axes and made a squad of three folks, 2 with an axe and 1 previous ranger with a crossbow, but didn't figure out the training part yet - I'll look at that later, I thought. I have time, I thought. So I just put some stone fall traps in the entrance and figured those would protect me against whatever small early attack the game would throw at me. And then the message came: "A vile force of darkness arrived!" I checked the map - a band of 10-ish goblins came to assault my fortress! So I thought "I'll let my squad and traps protect me", made a burrow starting from level 2 so everyone would stay in. By that time the goblins were entering the entrance hallway so I selected my sole squad and ordered them to attack the goblins. They died instantly without even noticeably hurting any of the goblins. "Okay traps, I'm counting on you now", I thought. The goblins ran towards the traps. The goblins just ran straight through without getting hurt. 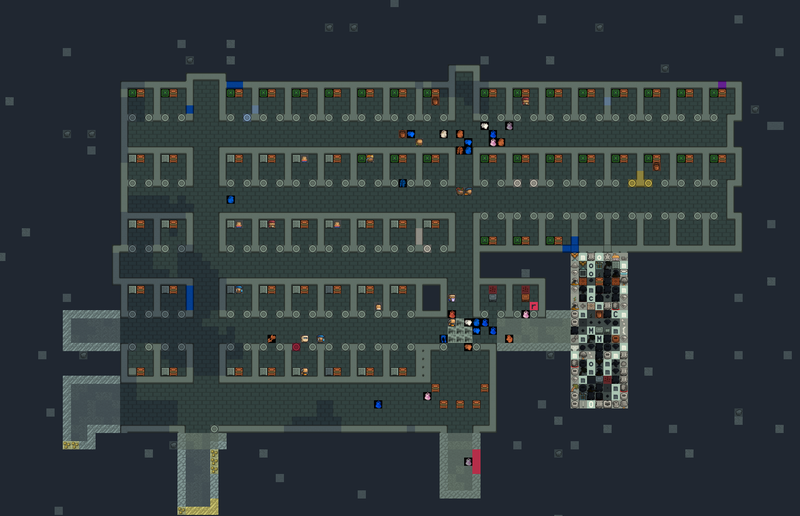 I watched as the population dwindled in a matter of seconds as my fortress got splattered with blood and corpses - we started at 104 dwarves and ended at 1. I thought it would be over soon. 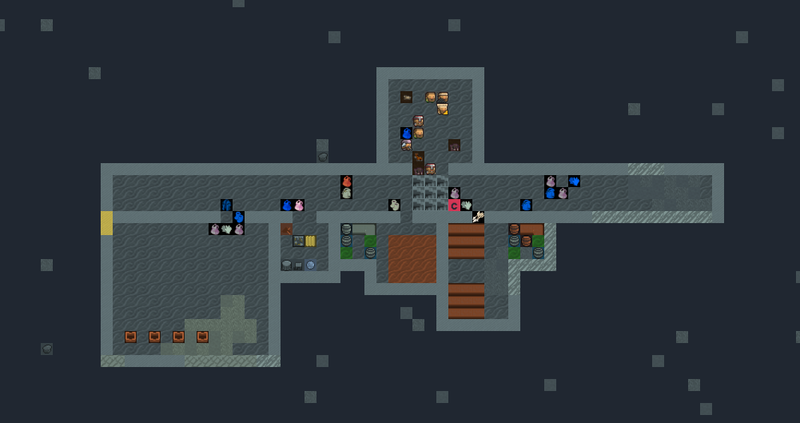 But the goblins left, leaving one man alive: the mayor, the most useful dwarf I had. They kept on wandering over the map for a while and eventually buggered off. In the meantime the mayor tried to do the hauling work of the entire fortress, which didn't work so well. 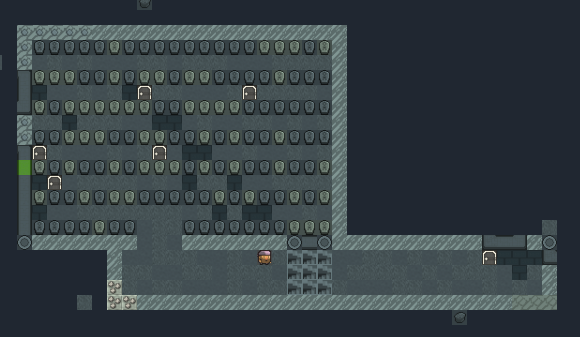 I didn't take long before ten-ish of my deceased dwarves started rising as ghosts because they weren't properly buried - so the mayor had to do all this work frightened pale because of all the undead spirits wandering around. The elven caravan came and I tried to trade for food, but by the time our mayor dragged all the stuff to the trading depot to trade they left. Oh well. A bit later the message finally came: new migrants! Time to get things running again. We had plenty of food, so I had time to get the alcohol production started again. There was just one problem: everyone stopped their tasks all the time because they were horrified by the ghosts and the corpses lying around. Which nevertheless didn't urge them to actually go and carry those to the corpses stockpile. I don't know why - they used it before so I know I did that correctly, but they just left them lying there. So I started operation Honour The Dead! 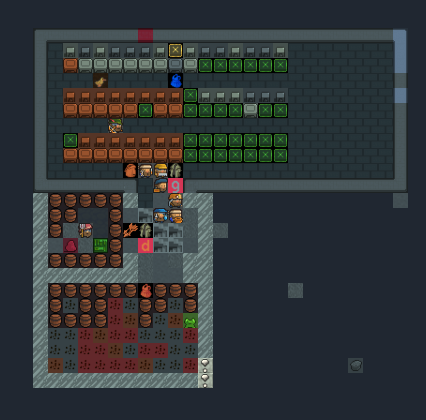 I dug a room on a unused floor and ordered nonstop production of stone coffins, filled the room with rows of planned coffins and stopped my dwarves from doing their normal tasks to get it done. I took a whole while - seriously, why do you need to check on every coffin manually to allow it to be used for burial? What would you otherwise do, use them for beer storage? Why no "graveyard room type"? Ugh. But eventually they laid everyone to rest, all 103 dwarves, and banished all the ghosts. They even cleaned away all the blood eventually. The original survivor was depressed (and kept throwing tantrums and hit people) and the first migrants were unhappy, but they were getting better! Things were looking up. The only things still remembering of the slaughter was the mass graveyard and the general storage room filled to the brim with clothing. I decided to further protect my fortress this time - with weapon traps! I made them make a bunch of menacing spikes and made 4 rows of weapon traps in the entrance. Most of them with a menacing wooden spike, but 1 row with added axes and crossbows, just to be sure. That should be enough, right? When my population was again at 40-ish, the message came again: "A vile force of darkness arrived!" This time no goblins but a band of human and elf bandits. So I got everyone inside again and hoped my traps would be enough this time. The weapon actually wounded some attackers and maybe even killed one, but most of them still ran through. And the walls splattered with blood, and the population went down again. But this time it stopped at zero. "Your strength has been broken." I lol'd at how they left your mayor. XD You did pretty well for your very first game! My first game, I splattered. 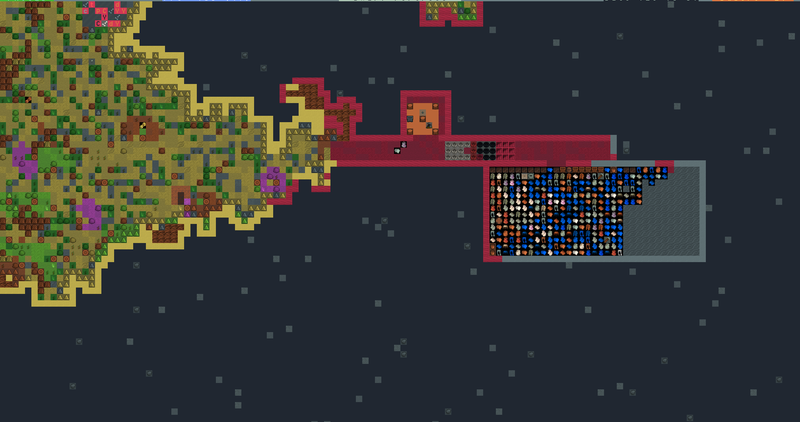 I dug into a pool from the side because I thought it was gems or something, then realized that my underground hole was flooding and panicked because I thought my dwarves were going to die (in 1/7 water, most likely). I learned through trial and error, without the wiki or forums. Very Fun way to learn, I can tell you that much. But I'd do it again in a heartbeat if I could. The learning experience was quite enjoyable. 1. If I recall correctly, animals that die from starvation cannot be butchered. Better to butcher them if they start starving and you can't do anything about it. 2. Butchers: Make a refuse pile near the butcher's shop, and keep the butcher's shop within easy distance of a food stockpile. Butcher's shops will generally only butcher corpses that are within x distance of the shop (can't remember how far, but it isn't far.) Make sure you have barrels to store the food in, too. 3. If you have the wood for it, spiked wooden balls make excellent trade goods. 4. Bridges save lives. Hooking them up to levers is easy. Make sure they raise towards the correct edge. 5. The reason for the grave thing is that sometimes you place a coffin and want it to be part of a tomb. You wouldn't want your dwarves filling your tomb with other people's bodyparts before you get a chance to designate the tomb. But yes, it takes a bit. Especially with 103 dead dwarves. 6. Wood is not decent as a weapon. Not good for weapon traps. For that, the best thing you can do is glass large serrated discs. Much blender. Very pieces. Wow. Thanks for 1-4, shall come in handy. 5. No, but a graveyard room would be handy. Like you don't have to assign every table to the dining room. 6. Don't have glass yet in fortress 2, but this time I filled each trap with 5 spikes and 5 spiked balls each, which should already work better than just 1. And I have a drawbridge-door. The map The top floor, complete with trade depot and general storage full of clothes of the dead The farm and brewing floor, with unused nest boxes and general meeting area The floor with stockpiles and workshops The floor with the kitchen, food storage and dining room The floor with the graveyard of the dead And the floor with all the bedrooms and quarters for the nobles. Your first fortress went a good deal better then mine. All of my dwarfs starved to death. Toys have joined instruments and goblets with items that can be used by dwarves in the game for the next release. Children can also play make believe and do little performances anywhere, no building required. Adorable dwarf-childs hype! Will this October be a DF release month?? There are two concepts I've found this past week that I never knew I wanted so bad. One of them was KeeperRL. The other one was Dwarf Fortress: Starship Troopers. 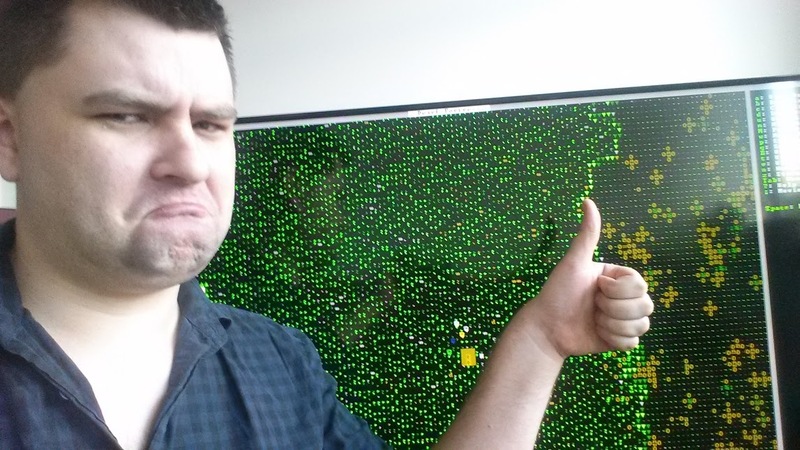 So, anyone want to direct me to the appropriate mod, or better yet, a guide to modding dwarf fortress? I'll take that as a no? The wiki is your friend. Talvieno wrote: The wiki is your friend. So, no Starship Troopers mod?